Despite the importance of analytical methods, at times data sensemaking leads to better decisions when we go with our guts. During the last few years enough books to fill a small library have been written about the importance of reflective, analytical thinking, alerting us to errors of less evolved thinking that we so easily slip into. I welcomed these books, read several, and even reviewed a few, but their popularity threatens to tip the balance too far in favor of analytical thinking. A yin and yang balance should exist between the reflective, rational techniques of analysis and the intuitive approach of experts, based on tacit knowledge that has been constructed through time and experience. Tacit knowledge is what enables experts to recognize patterns that others miss entirely. Mental models that experts construct to understand how things work are a form of tacit knowledge. Experts can often size up a situation and know how to respond long before they can articulate their reasons. Although we can get into trouble by trusting our guts, on occasions they serve us better than careful reflection. This is especially true when we deal with problems that dwell in the shadows-those that are murky and complex. This is the topic of a new book by Gary Klein, who is one of the finest and most insightful observers of human decision-making behavior in the world today. I first became familiar with Klein’s work when I read and reviewed his book Sources of Power: How People Make Decisions back in 2007. 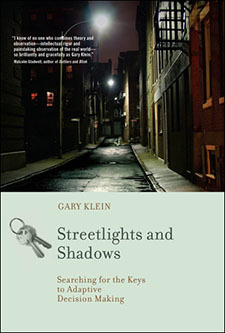 His new book is Streetlights and Shadows: Searching for the Keys to Adaptive Decision Making. Experienced-based thinking is different from analysis-based thinking. The two aren’t opposed to each other; they are complementary, like daytime vision and night vision. Experience-based thinking isn’t the absence of analysis. It’s the application of all that we have encountered and learned. This book is provocative in the way that it begins by listing 10 common beliefs about good decision making and then proceeds to tear down and replace them one by one. When you read this list, which follows, you might be surprised that anyone would question the merits of these popular beliefs. Teaching people procedures helps them perform tasks more skillfully. Decision biases distort our thinking. To make a decision, generate several options and compare them to pick the best one. We can reduce uncertainly by gathering more information. It’s bad to jump to conclusions-wait to see all the evidence. To get people to learn, give them feedback on the consequences of their actions. To make sense of a situation, we draw inferences from the data. The starting point for any project is to get a clear description of the goal. Our plans will succeed more often if we ID the biggest risks and find ways to eliminate them. Leaders can create common ground by assigning roles and setting ground rules in advance. In complex and ambiguous situations, there is no substitute for experience…We put too much emphasis on reducing errors and not enough on building expertise. A number of studies have shown that procedures help people handle typical tasks, but people do best in novel situations when they understand the system they need to control. People taught to understand the system develop richer mental models than people taught to follow procedures. Smart technologies can make us stupid…What I am criticizing is decision-support systems that rely on shaky claims and misguided beliefs about how people think and what they need. If you’re familiar with my work, you’ll notice that Klein and I both have a love-hate relationship with technology. When properly designed, decision-support technologies can serve as tools that help us think, but they can’t think for us. Relying on them too heavily and for the wrong things are common mistakes today. To use information technology effectively, we must know what computers do well and what people do well, and seamlessly interweave the strengths of both. Take the time to read Streetlights and Shadows. It is filled with important and at times surprising insights and Klein’s prose and many stories are just plain fun to read.